Presidential candidate Ted Cruz and the Tampa Bay Times' Pulitzer Prize-winning fact-checking website PolitiFact were at each others' throats last week over recent comments Cruz has made about the nuclear deal - officially known as the Joint Comprehensive Plan of Action (JCPOA) - reached this past July between Iran and six world powers. 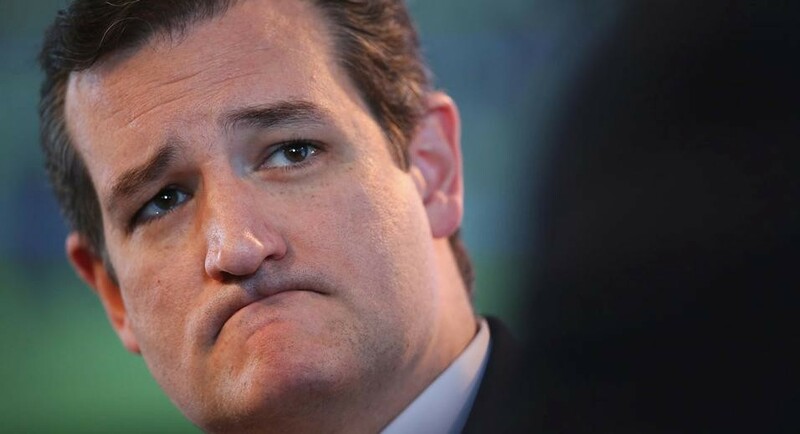 The main reason for the spat is simple: Ted Cruz lies a lot. At the rally, and afterward on Twitter, Cruz declared that the JCPOA "will facilitate and accelerate the nation of Iran acquiring nuclear weapons." Even for a demagogic blowhard like Cruz, this is a ridiculous thing to say. Beyond the fact that we've heard for over three decades that the advent of an Iranian nuke is just around the corner - only a few years, maybe two years, a year and half, 12 months, six weeks away! - and these estimates have never come close to fruition, nor have they ever been based upon a single shred of credible evidence, the enhanced monitoring and inspections implemented under the new deal effectively prevent any hypothetical Iranian move toward weaponizing its program for at least a decade, probably far longer. And that's if Iran does the thing it's never ever done: decide to build a nuclear weapon, and to do so at exactly the time when its program is under the most intensive scrutiny of any nation's program in history. The claim is absurd on its face. Needless to say, it wasn't too difficult for PolitiFact to judge this statement false. Specifically, the deal requires Iran to give up 97 percent of its stockpile of highly enriched uranium, the kind needed to make nuclear weapons, as well as most of the centrifuges it can use to enrich uranium. In addition, Iran agrees to only enrich uranium to a level unsuitable for weapons for 15 years, and to cease production of plutonium, the other element that can be used to build a bomb. Known nuclear sites would be monitored for 15 years to confirm compliance, and inspectors would have the ability to enter undeclared sites suspected of nuclear use, though with possible delays of up to 24 days. PolitiFact gets a bunch wrong here. First, the deal does not require "Iran to give up 97 percent of its stockpile of highly enriched uranium, the kind needed to make nuclear weapons." Why not? Because Iran doesn't have any highly enriched uranium to give up. Jacobson and Selby appear to have confused - or conflated - low enriched uranium with highly enriched uranium. This is no small matter and, unfortunately, is a common mistake made by commentators, politicians, journalists, and pundits who should all know better. The fact is Iran has never enriched uranium above 19.75 percent U-235, which is defined by the IAEA itself as "low enriched uranium." This is quite uncontroversial - no one, from the International Atomic Energy Agency (IAEA) to the U.S. intelligence community to the Israeli Mossad to non-proliferation experts, has ever claimed that Iran has produced a stockpile of highly enriched uranium (HEU). Iran has only ever produced low enriched uranium (LEU) - to levels of under 5 percent and under 20 percent - useful only as reactor fuel or medical isotopes, respectively, not bombs (which require enrichment levels of over 90 percent). Furthermore, the IAEA has confirmed that, "since 20 January 2014, Iran has not produced UF6 enriched above 5% U-235 and all of its stock of UF6 enriched up to 20% U-235 has been further processed through downblending or conversion." Additionally, as the agency has long confirmed, "All of the enrichment related activities at Iran’s declared facilities are under Agency safeguards, and all of the nuclear material, installed cascades, and feed and withdrawal stations at those facilities are subject to Agency containment and surveillance." What the JCPOA actually does, in this regard, is limit Iranian enrichment of uranium to no more than 3.67 percent U-235 LEU and, as the Arms Control Association notes, eliminates roughly 97 percent of Iran's current LEU stockpile, capping it at a mere 300kg for 15 years. 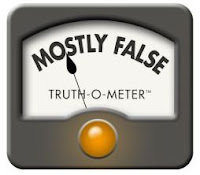 PolitiFact also erroneously claims that, under the deal, Iran must "cease production of plutonium," which makes no sense considering Iran has never produced plutonium. As I noted earlier this month, "Before it can be stockpiled, plutonium must first be extracted and reprocessed from the spent uranium fuel of an operational nuclear reactor. Iran has never done this and doesn't even have a reprocessing plant. Iran has literally never extracted plutonium from a reactor core, let alone stockpiled it..."
In short, Iran can't "cease" doing something it's not - and never has been - doing. PolitiFact's explanation of inspection parameters under the JCPOA is also disingenuous. By claiming that Iran's "[k]nown nuclear sites would be monitored for 15 years to confirm compliance," PolitiFact is implying that Iran's nuclear infrastructure is not already under safeguards and constant monitoring, which it is - and has been for years, if not decades. Iran's nuclear facilities have long been subject to the most intrusive and consistent inspection regime in the world. The deal only strengthens this regime, allowing constant and immediate access to all declared nuclear sites and also to non-nuclear sites like centrifuge assembly workshops, centrifuge rotor production workshops and storage facilities, and uranium mines and mills, which, as nonproliferation expert Jeffrey Lewis has pointed out, "are not safeguarded anywhere else in the world." This enhanced and unique access will last, in many cases, as long as 20-25 years. PolitiFact's language also suggests inspections of nuclear sites will cease after a decade and a half. This is totally wrong. In fact, all of Iran's declared nuclear sites will remain under IAEA safeguards and surveillance in perpetuity, as mandated by the Nuclear Nonproliferation Treaty, to which Iran has been a party since its advent in 1968. Even PolitiFact's understanding of "possible delays of up to 24 days" before "undeclared sites" are accessed by inspectors is dubious, as this is the absolute maximum amount of time that access to a potentially suspect facility could be delayed through a process agreed to by all seven international parties (eight, if you include the European Union) to the JCPOA. In truth, under the deal, the IAEA's request to visit a suspect site "triggers a 24-day clock under which Iran and the IAEA have 14 days to come to an agreement on access. If not, the Joint Commission, created by the JCPOA, has seven days to make a determination on access, and if at least five of the eight members vote to allow the IAEA to investigate, Iran has three days to comply," explains the Arms Control Association. At that point, the very first time this review protocol is tested to this extent, there's a good chance the process of re-implementing sanctions on Iran would begin, rendering the tenets of the JCPOA inoperable and signaling the imminent, if not immediate, collapse of the agreement altogether. 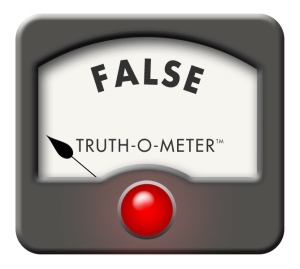 PolitiFact has rightly taken Ted Cruz to task for his false claims. 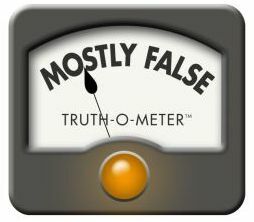 But in its own explanation of the Iran deal, PolitiFact repeats a number of baseless canards that have often been used by anti-diplomacy Iran hawks and deal-supporting liberal interventionists alike to mislead the public about the Iranian nuclear program and its capabilities. For a "fact-checking journalism website aimed at bringing you the truth in politics," PolitiFact should make sure to check itself before it, well, you know. A version of this article was crossposted by Fairness and Accuracy in Media (FAIR) on September 25, 2015. October 27, 2015 - Due to this post, PolitiFact issued a correction. But it didn't go far enough. Check out my update here.